The plentiful English that Flemings use in the workplace, on social media and in lecture theatres might appear to be slowly crowding out Dutch. So many English words – from hacken to babysitten – have crept into the Dutch vocabulary that a handful of organisations have made it their mission to fight the influence of English and preserve the Dutch language culture. Johan De Caluwe’s answer to people with such existential language fears: Relax, Dutch is doing just fine. And he’s got the data to back it up. 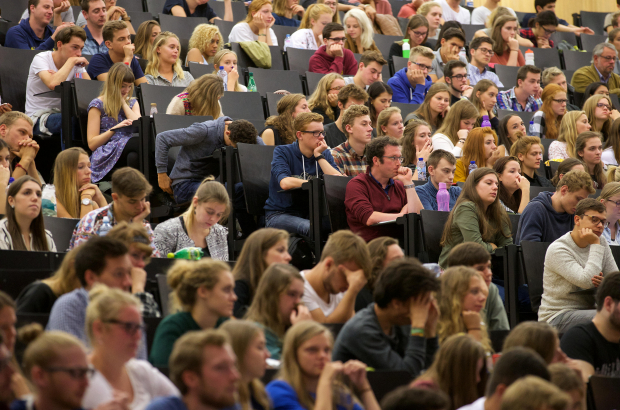 With a handful of colleagues at the Meertens Institute in the Netherlands, De Caluwe, a professor of Dutch linguistics at Ghent University, oversaw a large-scale study that explored the state of Dutch in Flanders and the Netherlands, the first of its kind. The study found no evidence to suggest that Dutch – spoken by 24 million people around the world and the eighth biggest language in the European Union by number of native speakers – is at risk of disappearing any time soon. The expansive study was commissioned by the Dutch Language Union, the organisation that defends the interests of Dutch-speakers by serving as knowledge centre, think tank and policy institute, and it will be repeated every two years. It was launched in response to the worries of ordinary citizens in Flanders and the Netherlands, De Caluwe explains, noting that the Dutch Language Union regularly received complaints and letters from Dutch-speakers genuinely worried about the future of Dutch in an increasingly global world that has adopted English as its common language. “There’s a real worry, and it’s increasing,” he says. “I think everyone felt that research was needed.” The study surveyed some 6,000 people in Flanders and the Netherlands on the social settings in which they choose to speak Dutch, and those in which they choose to speak, for instance, English, Italian or Arabic – from ordering takeaway food to commenting on a Facebook thread. The study found that Dutch continues to be the main language in all the domains surveyed but that it is facing strong competition from, and sometimes even being displaced by, English in four areas: internet and social media, academic publishing, university education and popular music. According to figures from the union, 22% of master’s degrees in Flanders are currently taught in a language that’s not Dutch, and usually that language is English (separate figures for English do not exist). In the Netherlands, that figure is 66%. The preference for English in higher education is having a ripple effect, with some primary schools now offering English as a separate subject – traditionally taught only in secondary school – or teaching subjects like history or geography in English. For a professor in Dutch linguistics, De Caluwe is coolly pragmatic about the importance of the language. “I don’t have an unconditional attachment to Dutch,” he says. “What’s important for me, and for the Dutch Language Union, are the interests of language users; that they are able to do everything they want to in that language,” he says. For instance, accessing Dutch-language texts on a particular topic, or being able to read user manuals and medicine package inserts. The Dutch and the Flemish could do a lot to protect their language if they stopped interjecting English words and entire phrases into their spoken Dutch. It's a bit of a snob thing imo. Like English speakers who inject 'je ne sais quoi' ... into their conversation. N'est-ce pas? With the world needing a common spoken language, it is not unusual to for people to feel this way. I come from the Caribbean where we were told that Creole would die as English, French and Dutch are strong. In reality, Creole is doing well and even the youth speak it with parents and grandparents. We do need to promote multilingualism and the benefits of speaking as many languages as you can. I cannot see Dutch being a long-term problem in reality. And, I guess I don't feel it because I have grown up in six countries and have never worried about language - one just gets on with it. But yes, English does tend to dominate in a group of many cultures together. I am sure we shall find an acceptable solution. The English language will save this country from itself. Adopting the English language will stop the "infighting" between Flanders and Wallonia. The Belgian Red Devils have already adopted an "English First" policy, the rest of the country should follow their very intelligent lead.